This activity was designed for high school anatomy students, though it could easily be used in biology or even elementary school classes. 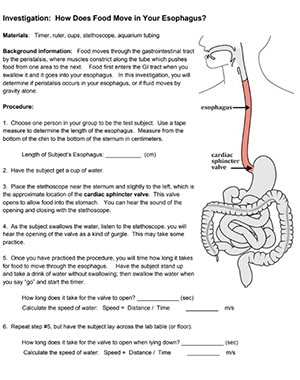 The goal is for students to determine if water moves down the esophagus by gravity or by the action of the muscles, peristalsis. First, students measure the length of the esophagus with ruler or a tape measure by measuring from the chin to the bottom of the sternum. A subject then swallows water while another student listens to the stomach with a stethoscope. The opening and closing of the cardiac sphincter valve will indicate how long it took for the water to travel the length of the esophagus. Students will repeat this procedure while subject is laying on his back. Finally, as a demonstration, the instructor shows water moving by gravity down aquarium tube. In each case, the speed of the movement is measured in cm/s.